Younger granddaughter Hazel was one year old on Wednesday. 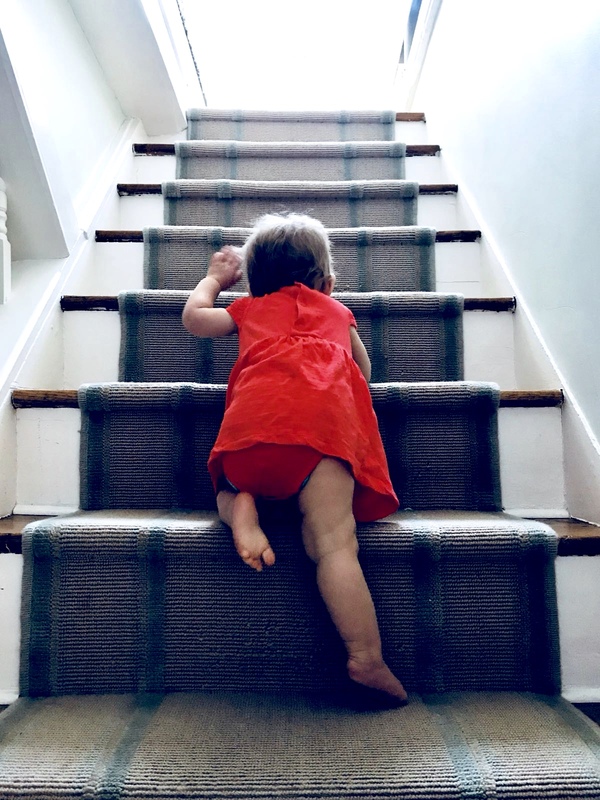 My daughter Susie captured this wonderful photo of a sweet little girl moving upward. Keep going, Hazel, but please don't hurry. The baby years flash by so quickly. Then they seem to be 'about three' for ages! My newest granddaughter Jolene is just 3 months older than Hazel. I know the feelings you are going through. An image of determination, motivation, and curiosity. A look of determination! Very cute. That little girl makes these stairs look huge. Hard to climb when the stairs come up to mid-thigh. I was thinking like TFG - the stairs look huge! She is determined though, Jack! Terrific shot! She seems determined. This is a perfect, precious shot.